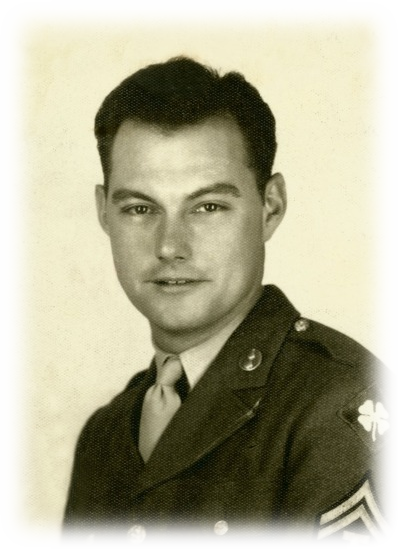 This site is dedicated to my father, Benjamin Joseph Wood, who served with the United States Army in the South Pacific during World War II. He was a simple man - and a wonderful man. Like so many soldiers, he seldom spoke of the war. His job was basically a carpenter and mechanic so we don't believe he was on the "front lines". However, he spent many days traveling in naval convoys, at high risk of attack by air and Kamikaze. He made a beach landing on a hostile island on the first day of the invasion of Lingayen Gulf, Philippines. His notes and letters speak of staying in fox holes on the beach at night and expecting to be overrun by Japanese at any time. He marched through the Philippine jungles and saw the immediate results of bloody battle. So, he certainly risked his life and bore the hardships of an American soldier involved in the South Pacific island hopping that drove the Japanese back to their homeland and to ultimate surrender. The horrors he experienced and witnessed changed his personality forever. But he came home, married and dedicated the rest of his life to raising his family in the free and safe America for which he fought. For his service and sacrifice both in war and in life, I dedicate this memorial website to him. Thank you, dad, for everything.